Last weekend, my husband and I had a blast at the Taste History Culinary Tours of historic Boynton Beach and Delray Beach. We learned a lot we did not know about the area, discover new areas and restaurants, and met some very nice people. The tour started out at Macy’s in Boynton Beach. You guys know I love Macy’s! I am working with them on a ton of events in the upcoming months. Check them out on the April Golightly event’s page. After boarding the tour bus, we learned a little about Florida History as we headed over the Hurricane Alley in Boynton Beach. The food was outstanding and we will definitely be returning. My husband fell in love with their Asian Calamari. He NEVER eats Calamari, but took the recommendation of the owner, who said she was not a calamari eater until she tried this salad. She converted him! I am ecstatic! Hurricane Alley has partnered with a fishing boat where if you go fishing on the Sea Mist III Drift Fishing Boat (located at the Boynton Marina, E. Ocean Ave. & Intra coastal), they will cook your catch for free. We are definitely bring my in laws on this trip and back to Hurricane Alley. 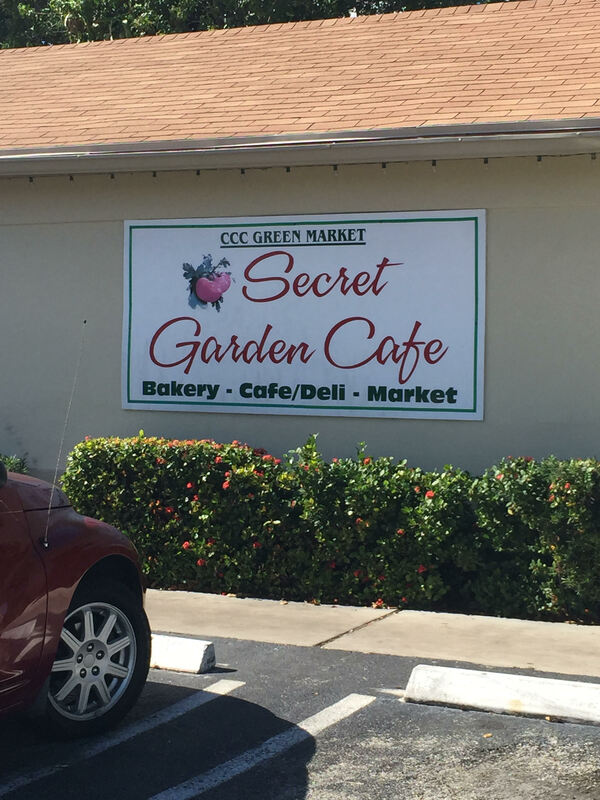 Our next stop was the Secret Garden Cafe is an incubator for the Community Center of Greater Boynton Beach. The mission statement and goal of the CCC is “to address the root causes of poverty by an innovative integration of social services programs, economic development (through small business incubation), nutrition education, and access to a healthy, affordable, and sustainable food center.” The food was delicious and it was great seeing the urban garden that it came from. We went to the Boynton Beach art district where local artists sell their art and have painted the outside of the garages. I love all the street art and will definitely be returning to take more photos and to fill up my poor empty walls. It is awesome to support local artists. Next we went to a local Italian Bakery in Boynton Beach called Palermo Bakery. They don’t use sugar or yeast in anything they make. Everything was delicious including my favorite rainbow cookies. Just like NY! We moved on to the next town, Delray Beach where we stopped by a Guyanese Restaurant, Bamboo Fire Cafe right off Atlantic Avenue. Then, we went onto the Ave where we went to La Macaroon and Scuola Vecchia Pizza. Great pics of you and your husband, and the places visited. And I enjoyed the article!